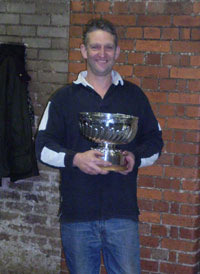 Gary Darlow, Meadow Bank Farm, Over Peover, Knutsford, is the first Horse Trust Open Farriery Champion. Gary (48) won the award, which included a perpetual rose bowl trophy and a cheque for £250, in a farriery contest at Melton Mowbray, Leicestershire. Competitors were required to participate in two classes – Hunter shoeing and Therapeutic shoeing. Points were awarded for each class and Gary was the overall winner. Gary, who treats riding ponies, polo ponies, hunters and Shire horses throughout Cheshire, started learning his trade in the mid-1970s. He has, he says, been competing ever since. “For the apprentices and other farriers, these contests are a fantastic learning curve – I’ve learned more by competing than from anything else,” he says. “You get the best people in the world at competitions and you can learn from watching them. Most of those who compete are very good at what they do – but are not recognised for it outside the farriery industry. He was thrilled by the letter from The Horse Trust following the awards ceremony. Paul Jepson, chief executive of the Trust, wrote: "I can think of no-one who has demonstrated a more consistently high standard of farriery over many years and you are a worthy champion."